It's Earth Day! Since its first celebration in 1970, Earth Day is a symbol of how important it is to live life simply and respectfully for our health, the health of our communities and the health of our planet. 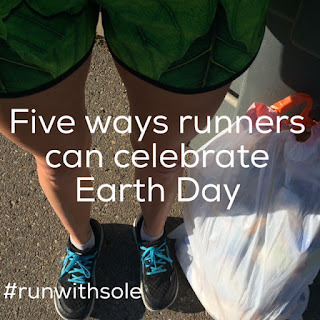 There are several ways we runners can celebrate Earth Day and by starting today, perhaps we can make every day Earth Day. Here are the best ways we runners can do our part on Earth Day and every day! Instead of hopping in the car to go to the bank, the post office or the grocery store, put on a backpack and running shoes and run those errands. You'll most likely save time, you'll definitely save money on gas (not to mention reduce your contribution to smog) and get a great workout. Bring a trash bag with you on your run and pick up the trash you see along your route. Picking up the trash you see along a short 3-mile run can make a huge difference in how your neighborhood looks. And you never know who is watching: your actions may lead to someone else picking up trash along their run or not dropping the trash on the ground in the first place. Just pop the full bag in a trash can as you finish your run and you'll be feeling good all day, inside and out. Old, beat up shoes are being recycled into new shoes, tracks at schools and so much more. Running stores often have bins in their stores to collect old running shoes. In addition, you can donate your shoes to non-profit organizations that send shoes to those in need all over the world, like Soles 4 Souls. Take this Earth Day as your opportunity to walk your child to school. Not only will you get a nice workout, but you'll be setting a great example of how you can easily be active without making a big deal out of it. And you may start a new routine! This one is my favorite! Take your run to the trails this Earth Day and take in the beauty of our beautiful planet. Trails offer a ton of benefits for your running, but more than that, they offer a chance for a peaceful and beautiful run. I love taking my runs to the trails! I was happy to see they were having a clean up day last Saturday. However, I was sad to see that I noticed the sign two hours too late! I would have liked to help pitch in since I use the trail often! Oh no! Hopefully you'll get to help out at another time! Great minds think alike! I have a huge bag of shoes I need to drop off today! I did a similiar post for Earth Day this year and love all of your tips! Yay! I'll be checking out your post today! LOL! I know that's another reason why we moved into our neighborhood too. We can walk to the Elem and middle schools! It's awesome. Nothing is more infuriating than seeing bottles of water, Gatorade or gus on running trails! or at Races!! nobody is too cool to take their own trash! Yeah it's really frustrating. Pack it in, pack it out! I know! And if you run to the grocery store, you can't really get more than you need since you have to carry it wherever you're running to!